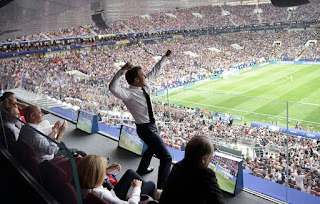 According to Football Bootas DB more players wore Nike boots (52.7 % | 387 players , followed by Adidas (263 players 35.7%) at the FIFA World Cup Brazil 2014. The remaining players wore other models from a variety of lesser known brands. For the most part these smaller companies look for niche areas or gaps in the market where they can establish their products. The German based company produce the Aspero Classic and Aspero Tec boot which feature leather uppers with Neokick touch control, and a ball control region right around the laces. Refined Nappa Leather strips are used to help grip and control the ball. The ball control area stops higher up the foot which creates a larger vamp for better ball contact. The boot is lined inside with a 3D Air Mesh to improve cushioning and ventilation, it also moulds to the foot reducing friction and foot slippage. On average the boots weigh 330g. They are currently not available for sale outside Germany and did not feature in the FIFA World Cup Brazil 2014 but they are becoming more popular among the Bundesliga players and may well feature in the future. The Concord Aston weighs 10.2oz. and appears outwardly to be more old school boot with thicker laces. 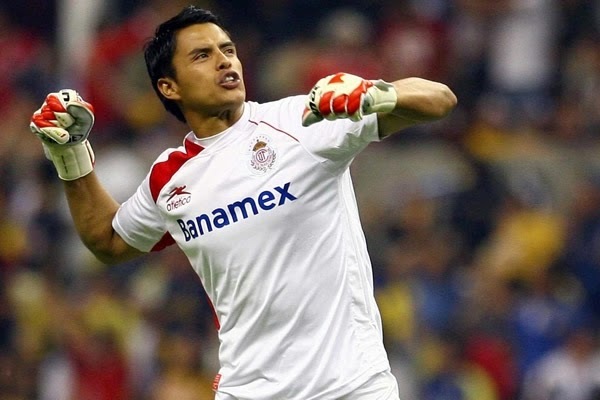 Both José "El Gallo" Vázquez and Carlos Alberto Peña (Mexico wore Concord S117CT at the FIFA World up Brazil 2014. After the Second World War , the Italian company soon established themselves as manufacturers of quality work shoes and mountain boots. 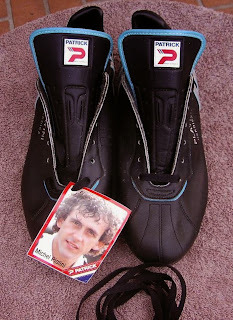 In the 70s they started to produce football boots with the help of Roberto Bettega (Juventus and Italy ) . 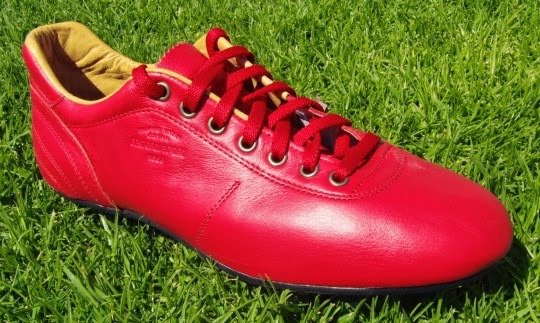 Their range came to include kangaroo leather with bladed polyurethane outsoles. with many top professionals including Zico , Van Basten, Baggio, Roy Keane, and Recoba associated with them. In 1985 the company signed a sponsorship contract for the Italian National Soccer Team. Diadora America is the #3 brand in the market share in football (soccer). 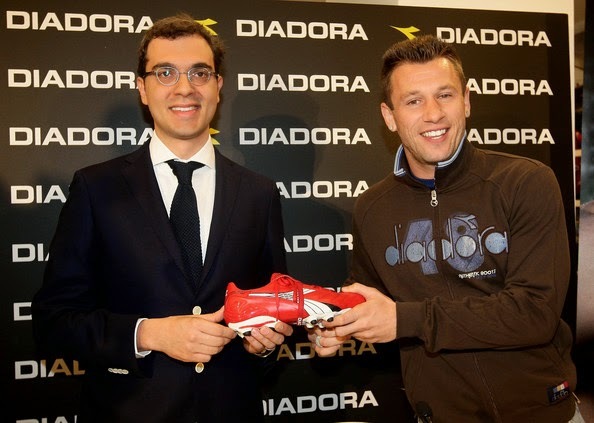 Antonio Cassano (Parma and Italy) is a brand ambassador for Diadora and wears Diadora DD-NA 2 GLX 14 during the FIFA World Cup Brazil 2014. Mickaël Landreau (France ) wore Kipsta 700 pro soccer cleats at the FIFA World Cup Brazil 2014. The company was established in 1973 by the Caberlotto family in Montebelluna, Northern Italy and started producing tennis shoes. Known for their sports clothing Lotto initially concentrated on the Italian market. 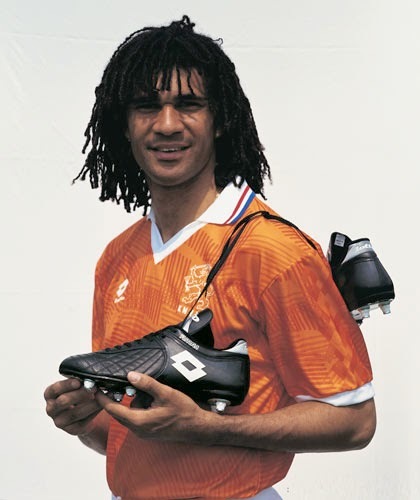 They started production of football boots in the 1980s and signed major collaboration agreements with Dino Zoff and Ruud Gullit. A takeover in 1999 saw the company renamed as Lotto Sport Italia and they now distribute in more than 60 countries. For the FIFA World Cup Brazil 2014 Lotto signed 5 players : Cristian Zapata (Colombia ), Johnny Acosta (Costa Rica), Esteban Granados (Costa Rica), and Máximo Banguera (Ecuador) will wear Lotta Solista boots. Maximo Banguera's boots have a special skin that reflects light, which the Italian shoemaker claims causes the shoes to “glow” in direct sunshine or under bright lights. 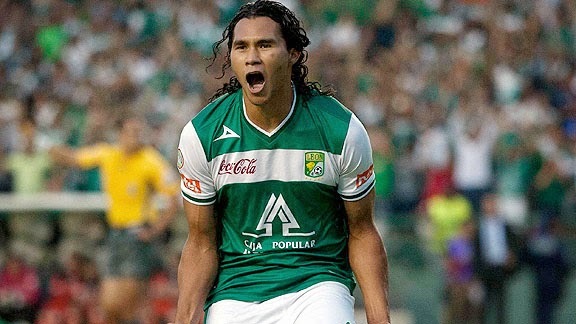 Adrian Bone (Equador ) will wear Lotto Zhero Gravit boots . A Japanese boot supplier with plenty of new polymer technology packed into their soccer boots. Mizuno offers several different 2014 World Cup Boots, including the totally new Basara Speed Boot . Other popular ranges include Mizuno Morelia Neo and the Mizuno Wave Ignitus. Brazilian striker Givanildo Vieira de Souza better known as Hulk (Brazil) wore Mizuno Morelia Neo. These are soft and lightweight kangaroo leather cleats made exclusively in Japan. Dual density outsole technology provides forefoot flexibility and midfoot shank rigidity, offering a barefoot feeling to maximize performance and touch. The High tech engineered outsoles provide flexibility and stability, offering a barefoot feeling to maximize performance and touch. The molded cleats are specifically made to provide traction and stability on firm ground fields. 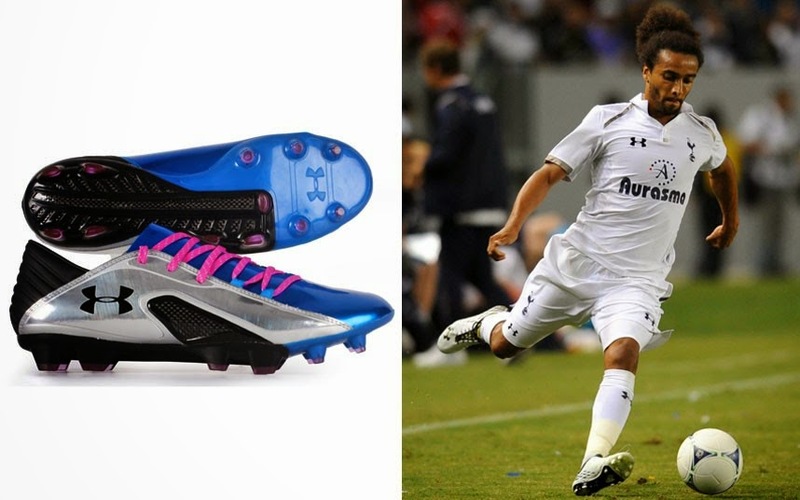 Ha Dae-Sung is a member of the South Korea 2014 World Cup Squad and wears Mizuno Morelia Neo Japan soccer cleats. Mizuno Wave Ignitus are made to maximize kicking motion. The Primeskin uppers include specially designed panels (Tatekaiten and Yokokaiten Panels) that according to the manufacturers help drive, curl, and strike with precision and focus. The Mukaiten Panel (non-spin area) again according to the manufacturer offers the ability to create an unpredictable ball flight. The outsole design is based on soccer player bio mechanics data, allowing for stability and grip during ball strike, stability through the midfoot, and reduced pressure on the foot. 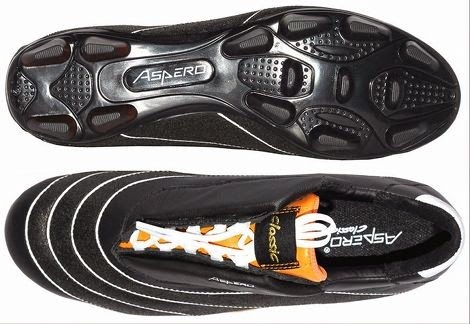 Blade shaped studs provide exceptional traction on any firm ground field. 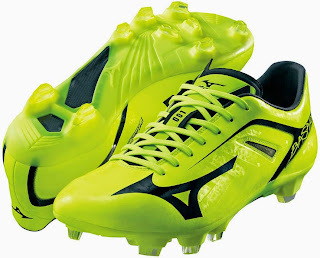 Maya Yoshida (Japan) and will wear Mizuno Wave Ignitus soccer cleats. The new purple Mizuno Wave Ignitus III Boot is a special colorway called Morpho, inspired by the blue color of the Morpho rhetenor butterfly (blue elongate Atlas butterfly). 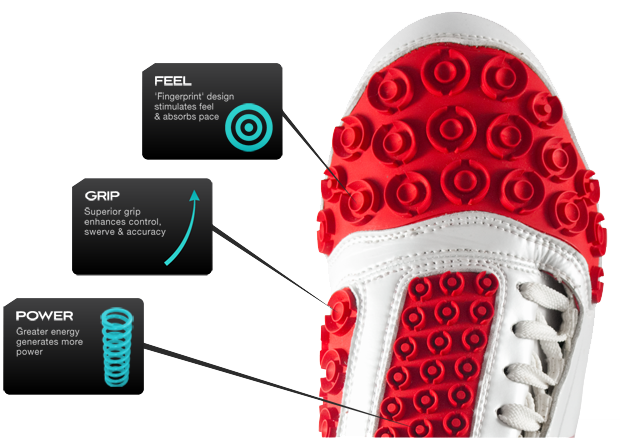 The outsole is made for firm ground surfaces with blade shaped studs to increase traction and reduce stud pressure. 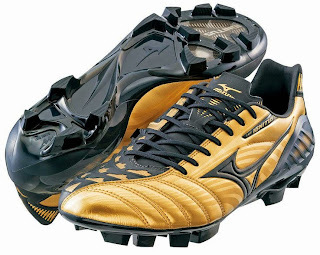 The gold / black Mizuno Wave Ignitus III Boot will be worn by the Japanese midfielder Keisuke Honda during the 2014 World Cup. Toshihiro Aoyama is a member of the Japan 2014 World Cup Squad and wore Mizuno Morelia II soccer cleats. 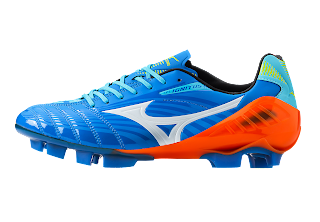 The Primeskin upper of the new Mizuno Basara 001 high performance football boot is also used for the Wave Ignitus III Boot. The synthetic upper material Prime Skin is made for a perfect ball control in all weather conditions. It also reduces weight because the Primeskin upper is thinner. The upper material has comparable softness and feel to kangaroo leather but with added an improved durability and a more structured fit. The silver R-Fiber Control technology used within the upper helps reduce excess stretching. The weight of the Mizuno Basara Boot: 175g. The outsole features the D-Flex Groove. The diagonal groove in the midfoot area allows the player to turn at maximum speed. The stud configuration comes with just two studs at the heel area for maximum speed. To reduce slipping, the insole of the new Mizuno Basara Boot features the new Zero Glide technology. 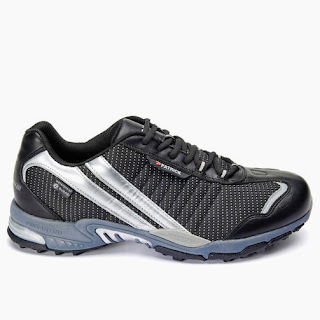 ZeroGlide helps to reduces gap and slip of the foot in the shoe to provide a better traction. The yellow boot were worn by Shinji Okazaki (Japan) in Brazil. 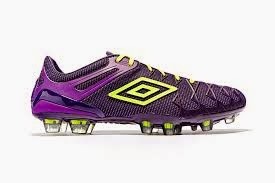 An Italian manufacturer of football boots, clothing and leisure footwear the company was established in 1886. Pantofola d’Oro started making customized football boots and trainers in the 1950s when Emidio Lazzarini took over the business from his father. The classic Lazzarini Canguro is made made from one piece of leather hand stitched to a very basic looking soleplate. The tongue is lined with suede for added comfort. The boots are old school style and have no added bells or whistles but just ooze pure style. Unlike their modern counterparts the leather is prone to absorb water in wet conditions and does increase in weight with play but otherwise pure yesteryear class. 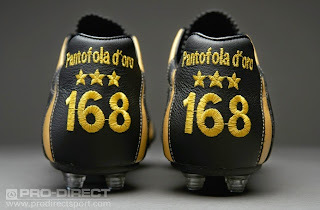 Pantofola d’Oro boots were worn by players like Ferenc Puskas (Hungary) ), Jurgen Klinsmann<./a> (West Germany) , Sven Goran Erikkson and Roger Milla (Cameroon) . Patrick (originally Patrick-Chaussures Techniques), was founded by Patrice Beneteau in 1892. They made a variety of quality sport shoes in a small factory in Vendée, France. More recently the company moved head quarters to Oudenaarde, East Flanders, in Belgium. 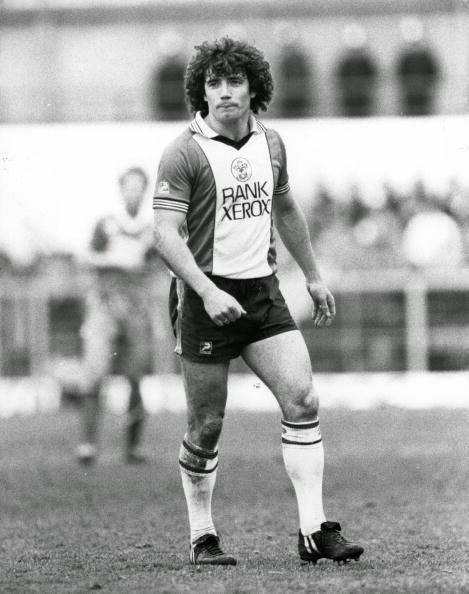 During the 70s and 80s Patrick sponsored Michel Platini (France) and Kevin Keegan Keegan later claimed in his autobiography he only wore the boots for the money. Despite this the company made high quality foot gear which sold well. By the nineties Patrick withdrew from sponsorships as adidas and Nike began to dominate the marketplace. Instead the company exploited the market for referee boots. Frank De Bleeckere collaborated with Patrick to promote a shoe. 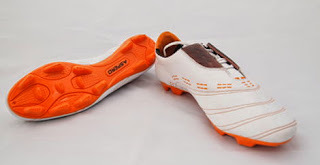 They continue to make old school styled soccer boots with the Patrick GoldCup the flagship of their current range. 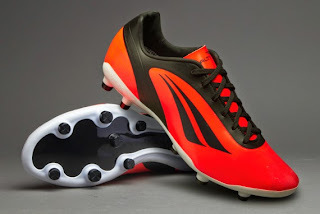 The boots are available in soft full grain Kangaroo skin with different cleat designs. Completely lined for comfort they have an embroidered leather tongue, sides and spoilers, as well as a fully stitched polyurethane sole with molded polyurethane cleats or screw in stud options. Some models have reinforced heel counters and triple hardness outsole for durability. Penalty is a Brazilian sporting goods company established in 1970 and mainly supplying products for football market. In the 1980s, Penalty became the largest Brazilian manufacturer of balls. 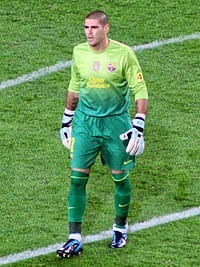 In 2011 the company designed an exclusive boot for Victor Valdes (F C Barcelona and Spain). Victor wore the Adidas Predator Instinct soccer cleats in Brazil. 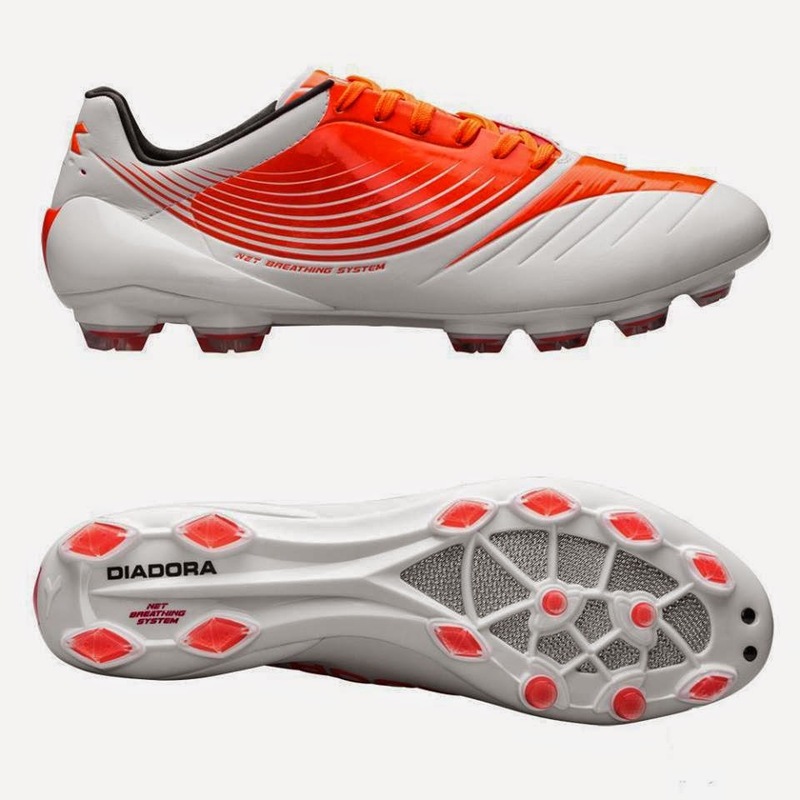 The Penalty S11 PRO boot incorporates a Celeron soleplate and a Tenvis technology upper (both unique to Penalty). 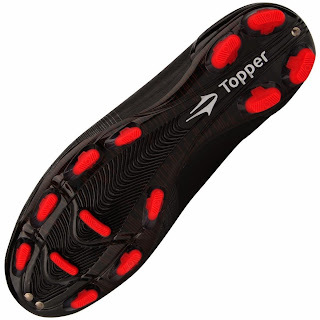 Topper is a South American Company which was founded in 1975, as a subsidiary of Alpargatas . During the 1980s Topper became one of the most important sportsbrand of Argentina. Currently the signature boot is The Topper Velocity boot which was designed to give quick players maximum speed. Topper also make the “Fuerza” which is a best suited for strikers and the “Classico”, a more old school boot with leather uppers. A UK sportswear and football equipment supplier based in Manchester. 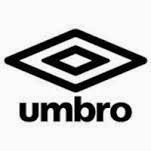 The company was founded by Harold and Wallace Humphreys and the name "Umbro" a quasi-portmanteau from Humphreys Brothers Clothing. The Umbro's kit debut was in 1934 at the FA Cup final, when Manchester City and Portsmouth wore kits designed and manufactured by the company. Brazil became the first FIFA World Cup champion to wear kits by Umbro in 1958. 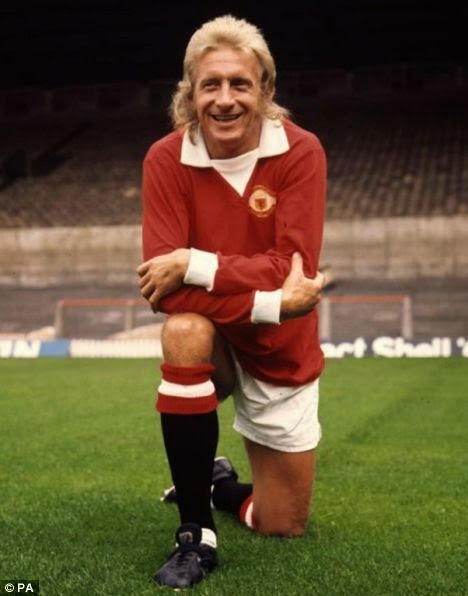 In 1960 Denis Law (Manchester United) became the first footballer to be sponsored by Umbro. 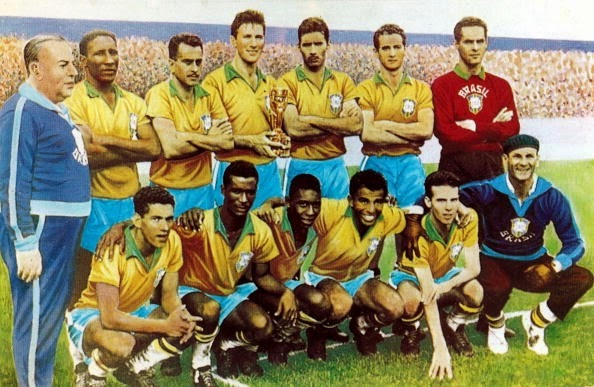 England lifted the World Cup wearing kits by Umbro in 1966. In 1985 Umbro successfully introduced its first football boot in Brazil then a year later the company started supplying boots internationally. The company was bought by Nike, Inc. in 2007 in a deal worth GB£285 million. Nike later sold the company in 2012. 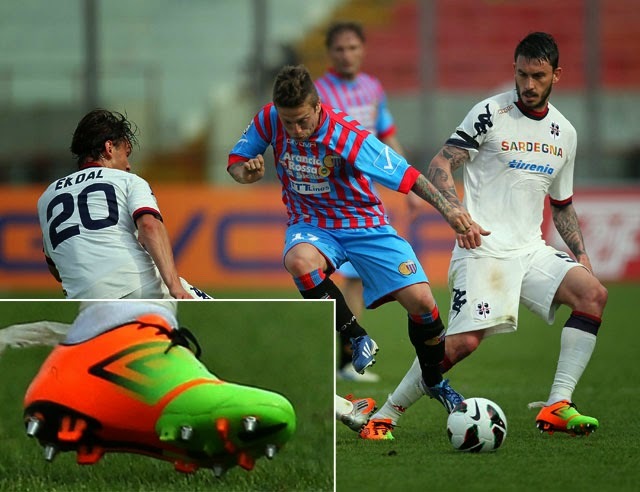 At the FIFA World Cup Brazil 2014 Mauricio Pinilla (Chile) plays in Umbro Geo Flare. The upper has a textured detailing offering enhanced control. 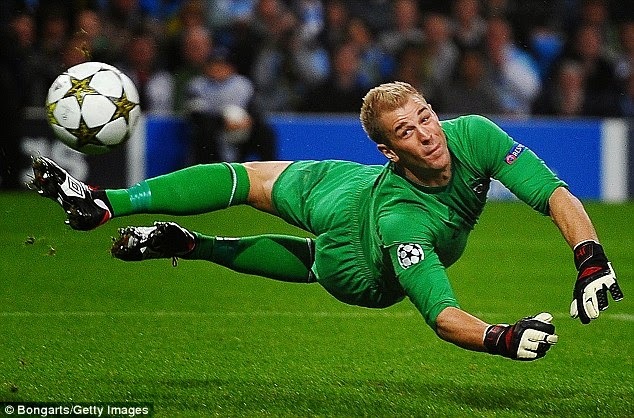 Joe Hart ( England ) plays in Umbro UX-1. The lightweight boots are built for comfort and control and have evolved from the A-Frame design and protective spine cushions. A dual density cage and a soft protective spine cushion the heel and safeguard the Achilles. The boots have a seamless one piece upper made from light, breathable material, which exhibits both strength and resilience. On the soles are nine forefront studs spaced to reduce pressure and increase comfort. Four conical heel studs create superior traction, making it easier to change direction fast. 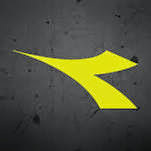 Under Armour, Inc. is a North American supplier of sportswear and casual apparel. The company was founded in 1996 and started selling selling footwear a decade later . Shoes are now Under Armour's fastest growing product line, growing 31% from 2011 to $239 million in sales in 2012. Under Armour ClutchFit boots include ClutchFit™ technology to wrap players’ feet in a lightweight “second skin.” This is both comfortable and supportive. Alfredo Talavera (Mexico) wears Armour ClutchFit boots. Cameroon’s Benoit Assou-Ekotta wears Under Armour Blur Carbon III soccer cleats. These are made from a one-piece synthetic upper with a perforated tongue and die-cut sockliners are added for cushioning and comfort. 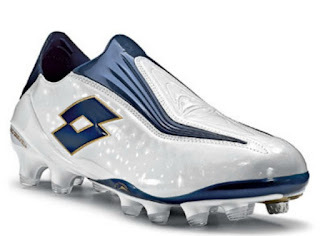 Wider cleat placement and lateral outrigger allows quick directional changes. The boots weigh 8.8 oz. Australian company based in Melbourne the Zygo Deztruct (under 310g*) has a soft microfibre upper with a side lacing system. The boot incorporates an internal TPU heel counter and moulded outsole and is designed using strategically positioned pods at the throat, toe and instep regions. According to the manufacturers the energy pods perform like a spring, storing and releasing vital energy as well as providing larger sweet spots. The ensuing friction provides exceptional grip assisting ball control and accuracy. The instep zone amplifies spin and swerve. This is a universal kicking boot suitable for soccer, Australian Rules and rugby.